Have a wildcat fan in your life? We've got the perfect thing! 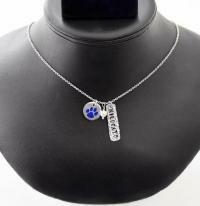 This adorable UK Wildcat necklace consists of 2 aluminum charms and a pearl drop in between. Necklace is stainless steel. Both stainless steel and aluminum will not rust or tarnish. This necklace is perfect for every day wear.